A rupees 50 crore plus mega production in silver screen on St. Thomas, one of the twelve apostles of Jesus Christ, who is believed to have spread the Christian faith in Tamil Nadu and Kerala, is under way. This film is going to be launched as a major project by the Catholic Archdiocese of Madras-Mylapore on 3 July 2008. This proposed film will deal with the story relating to the journey of St. Thomas to Edessa, a town in Syria in 29 AD. His travel through Persia to Taxila in modern Pakistan and return to Jerusalem will also be covered. It has been reported that the legend relating to his reaching Kerala in 52 AD and his subsequent 20 years of preaching the Christian faith in India will constitute the major part of the proposed film. St. Thomas’s meeting with Tiruvalluvar is going to be yet another interesting part of the story. How and why did Archbishop Arulappa hand over a whopping amount of Rs.13,49,250/- to Ganesh Iyer for a spurious research project on St. Thomas? Why had the Archbishop not bothered to verify the authenticity of the criminally fake ”documents” produced by Ganesh Iyer in support of his research thesis (which was originally proposed to him by Archbishop Arulappa himself!) Why did Archbishop Arulappa not deem it necessary to accompany Ganesh Iyer to the various sites of his ”research” in India when he had found adequate time to accompany him to Rome, the Vatican, Germany, France, Spain and the United States. The story of the intimate intellectual relationship between Archbishop Arulappa and Ganesh Iyer (given the title of Acharya Paul by Archbishop Arulappa himself!) indeed constitutes a glorious landmark in the intellectual history of Christianity in India! 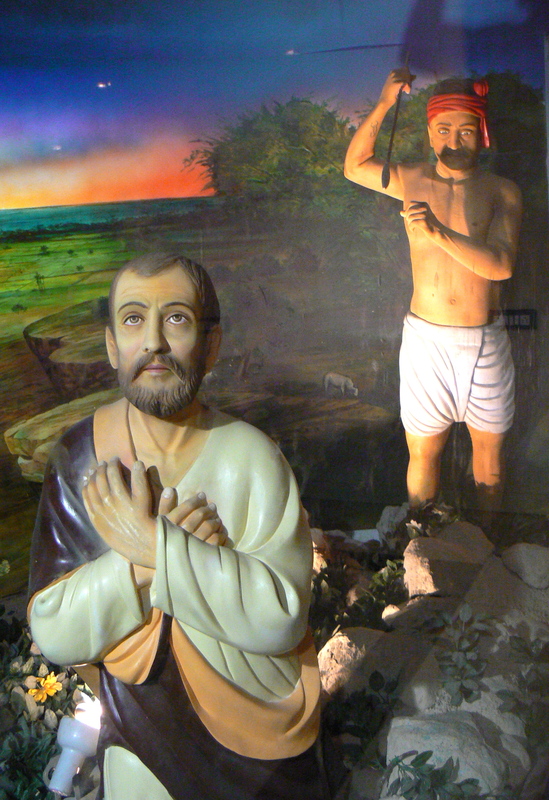 Archbishop Arulappa had directed Acharya Paul to establish a nexus between St. Thomas and Tiruvalluvar, regardless of the concerns for exact chronology or authentic history. ”Scrupulous” Acharya Paul extended his full cooperation to the equally “Scrupulous” Archbishop! The whole story relating to this gigantic hoax was exposed in an article in The Illustrated Weekly of India in its issue dated April 26-May 2, 1987. This article, titled “Hoax!” was authored by K.P.Sunil. This very article was incorporated by Ishwar Sharan in his book on St. Thomas under the title “Archbishop Arulappa Makes History”. Pope Benedict has denied that St. Thomas brought Christianity to South India, a public statement that Archbishop Chinnappa apparently has ignored. In an attempt to understand the relationship between the Pope and his bishops, I have been reading in the Internet a series of articles on Rome’s fraudulent history by Dave Hunt. I am quoting below some excerpts from his brilliant book titled A Woman Rides the Beast: The Roman Catholic Church and the Last Days by Dave Hunt. The extra-ordinary position of the Pope in relation to members of the Church was expressed succinctly in Rome’s La Civilta Cattolica, which a papal journal described in the mid-nineteenth century as “the purest journalistic organ of true Church doctrine” (J.H. Ignaz von Dollinger, The Pope and the Council) “It is not enough for the people only to know that the Pope is the head of the Church … they must also understand that their own faith and religious life flow from him; that in him is the bond which unites Catholics to one another, and the power which strengthens and the light which guides them; that he is the dispenser of spiritual graces, the giver of the benefits of religion, the upholder of justice, and the protector of the oppressed” (La Civilta Cattolica, 1867, Vol. XII). The Catholic World in August 1871 (Vol. XIII) declared as follows: “Each individual must receive the faith and law from the Church with unquestioning submission and obedience of the intellect and the will…. We have no right to ask reasons of the Church, any more than of Almighty God…. We are to take with unquestioning docility whatever instruction the Church gives us”. The same requirement of unthinking submission is demanded in Vatican II. The Code of Canon Law likewise reasserts the same rule: “The Christian faithful, conscious of their own responsibility, are bound by Christian obedience to follow what the sacred pastors, as representatives of Christ, declare as teachers of the faith or determine as leaders of the Church” (James A. Coriden, Thomas J. Green, Donald E. Heintschel, eds., The Code of Canon Law, Canon 212, Section 1; Paulist Press, 1985). This article is excerpted from a four-part article called “Fraudulent Myth of the Tomb of St. Thomas” which appeared on the News Today website on 2 to 5 July 2008. The original article can be accessed in the News Today archives. This entry was posted in christianity, history writing, indian history, ishwar sharan, media, mylapore, religion, santhome cathedral, st. thomas, thomas the apostle and tagged apostle thomas, benedict xvi, chennai media, christianity, indian history, ishwar sharan, madras, mylapore, religious history, santhome cathedral, st. thomas apostle, vatican. Bookmark the permalink.